Introduction: There's something so very pure about hand made, wooden baits for fishing. Just the mention of that process conjures up imagery of someone sitting on their front porch in the twilight of day, pocket knife in hand, chunk of wood in the other, and wood shavings all over the ground. But as our autopsy of that +$400 bait from Japan a few weeks ago proved, there's so very much more that goes into these creations today. 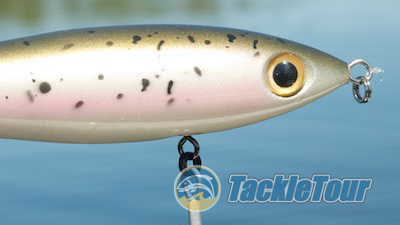 Introducing Delta Wood Bomber's Sinister topwater lure. A few years ago, a company out of Sacramento, California jumped into the scene with an oversized wooden topwater plug that shops within a two hour radius of the California Delta could not keep in stock. Bass, and more importantly in these parts, big striper were being caught on this thing and people knew about it. We've been sitting on this bait for a couple years ourselves but now it's finally time to share. 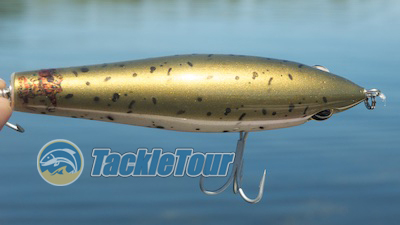 Introducing our look at Delta Wood Bomber's topwater plug, the Sinister. Quality/Construction: The Sinister comes in two sizes, five inch and six inch (5" & 6") and is hand made out of Alaskan Yellow Cedar - a very popular wood amongst builders for its clear, knot free characteristics. 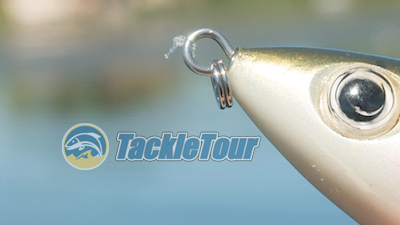 The baits feature super clean finishes, but also very simple detailing. Hardware is all very stout (these plugs are intended for striper) and craftsmanship is very good. The Sinister is a hand made wooden plug available in 5" and 6" lengths. 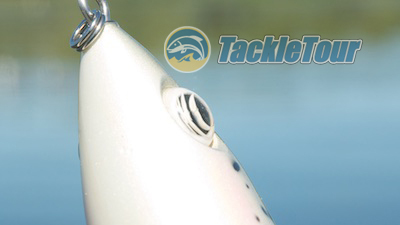 Performance: Getting the bait is one thing, making sure you have the right setup with which to throw this bait is critical. 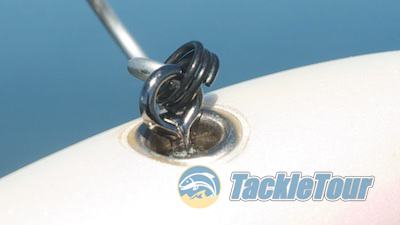 The first time I tied this plug to the end of my line, I was using a heavy powered rod matched with a reel spooled with braid. I tied straight to the braid with no leader, chucked the bait out as far as I could and tried to work it. The Sinister came back to me straight with each twitch of my rod. It didn't walk. I tried again, same result, so I cut the bait off. Naturally, it works better tied to the split ring, but we tried it both ways. I had a spool of 14 lb mono in my tackle bag, so I tied on a leader thinking the bait probably needed a more forgiving line to walk. After pulling off about twenty feet of mono and tying the leader, I reattached the bait, cast it out and tried again. A little better, but still not much action. I had been tying to the split ring attached to the lure's line tie, so I tried retying but this time direct to the line tie - same result. Zander and I looked at each other with the same thought - not so good. I cut the bait off and dismissed it. 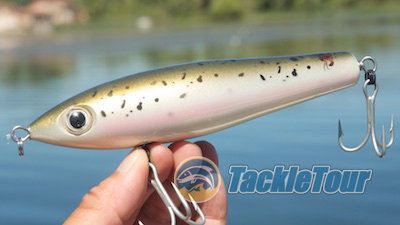 The shape of this lure is very simple. A few days later, I went back to the shop where I first saw this bait, Hi's Tackle Box in South San Francisco, and asked them if there was any discussion from other customers as to the setup they were using for this bait, whether it was truly effective, or if it was just another hyped up bait company that people were excited about because it was local? The only real bit of detailing is at the eye with the recessed eye socket. They told me the reason this bait has burst onto the scene was because Bobby Barrack had been catching a lot of big striper with this bait in the Delta, but they weren't sure of his setup. I took in that bit of information and was determined to try again. This time I was more careful with my selection in tackle. 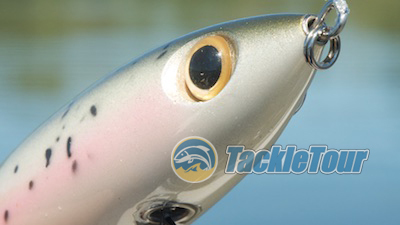 The realistic eyes still extend beyond the bait's profile giving it the appearance of a more realistic fish head. I pulled down my Megabass F7-76RDti Slant Bridge White Python, and matched it with an Abu Garcia Revo Winch spooled with 25lb Sunline Supernatural nylon monofilament. The White Python is a stout stick, but has a nice, moderate bend and forgiving tip so it probably wouldn't pull the bait quite as hard. My strategy with the heavy nylon monofilament was to have a line with some stretch, but that also floats to create a little drag in the water slowing down the lure even more. This bait comes with super stout hardware.